Posted on Tue, Apr 10, 2012 : 5:54 a.m.
Emerald Dragonfly closed its doors on March 31. Emerald Dragonfly, a flower and hand-made gifts shop in Kerrytown, closed its doors recently, leaving the Ann Arbor retail property open for new tenants. The 2,850-square-foot store is at 419 Detroit St., across from Zingerman’s Deli. The building’s owner, Elaine Johns, said Emerald Dragonfly closed abruptly, but fulfilled its five-year lease. Johns said the exact reason of the closure is unknown, but she thinks the rough economic times were a contributing factor. 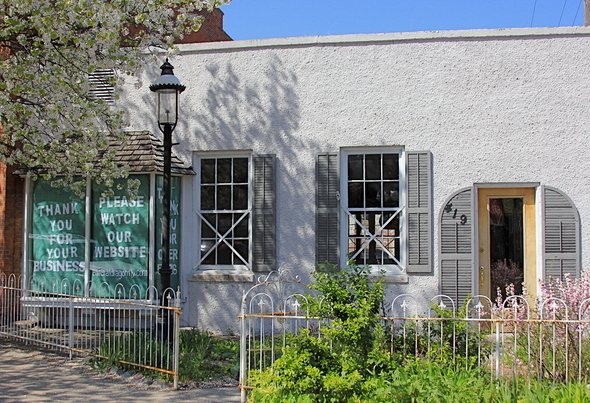 The shop's last business day was Saturday, March 31. Deb and Joe Kirk opened Emerald Dragonfly in 2007. They sold hand-made gifts such as stained glass artwork and birch baskets and occasionally taught a children’s art class, according to Johns. Deb and Joe Kirk were unavailable for comment. They also run a web business, earthessenceshop.com. Mike Giraud of Swisher Commercial will be listing the property. He expects that the storefront, located on the corner of Kingsley, will be filled quickly. Giraud said the space could be leased for a service, retail or restaurant business. The listing price has not been determined. Tue, Apr 10, 2012 : 9:11 p.m.
Tue, Apr 10, 2012 : 3:01 p.m.
Bring back The Tree! It should never have closed. Tue, Apr 10, 2012 : 4:51 p.m. Yes! I miss The Tree. Tue, Apr 10, 2012 : 4:26 p.m.
Was that a second hand clothing store? Tue, Apr 10, 2012 : 12:01 p.m. I visited the shop once, soon after it opened. A minute into my visit my thought was 'This will never last!'. I am just surprised they stuck it out for five years. Their merchandise seemed dated and sparse.